DURHAM, N.H. – Inspired by elements found in nature, researchers at the University of New Hampshire say the puzzle-like wavy structure of the delicate seed coat, found in plants like succulents and some grasses, could hold the secret to creating new smart materials strong enough to be used in items like body armor, screens, and airplane panels. "The seed coat's major function is to protect the seed but it also needs to become soft to allow the seed to germinate, so the mechanical property changes," said Yaning Li, associate professor of mechanical engineering. "By learning from nature it may be possible to tailor the geometry and create the architecture for a smart material that can be programmed to amplify the strength and toughness but also be flexible and have many different applications." The building blocks of the seed coat are star-shaped epidermal cells which move by zigzag intercellular joints to form a compact, tiled exterior that protects the seed inside from mechanical damage and other environmental stresses, such as drought, freezing, and bacterial infection. To better understand the relationship between the structural attributes and functions of the seed coat's unique microstructure, prototypes were designed and fabricated using multi-material 3D printing, and mechanical experiments and finite element simulations were performed on the models. "Imagine a window, or the exterior of an airplane, that is really strong but not brittle," said Li. "That same concept could create smart material that could be adapted to behave differently in different situations whether it's a more flexible body armor that is still protective or another such materials." 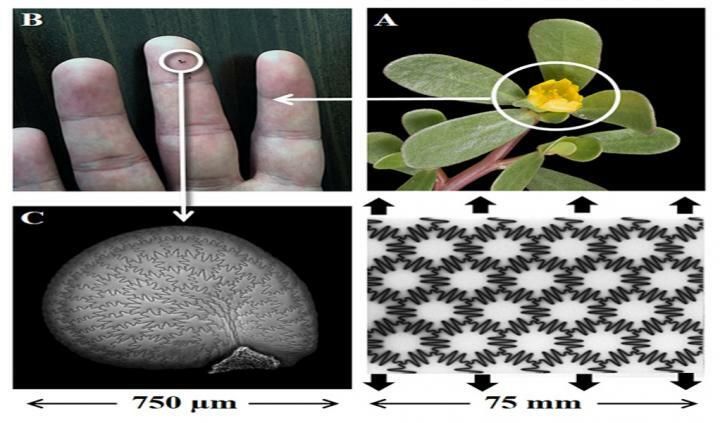 The results, published in the journal Advanced Materials, show that the waviness of the mosaic-like tiled structures of the seed coat, called sutural tessellations, plays a key role in determining the mechanical response. Generally, the wavier it is, the more an applied loads can effectively transit from the soft wavy interface to the hard phase, and therefore both overall strength and toughness can simultaneously be increased. Researchers say that the design principles described show a promising approach for increasing the mechanical performance of tiled composites of man-made materials. Since the overall mechanical properties of the prototypes could be tuned over a very large range by simply varying the waviness of the mosaic-like structures, they believe it can provide a roadmap for the development of new functionally graded composites that could be used in protection, as well as energy absorption and dissipation. There is a pending patent which has been filed by UNHInnovation, which advocates for, manages, and promotes UNH's intellectual property. This work was supported by National Science Foundation (NSF) and U.S. Air Force Office of Scientific Research (AFOSR). The University of New Hampshire is a flagship research university that inspires innovation and transforms lives in our state, nation and world. More than 16,000 students from all 50 states and 71 countries engage with an award-winning faculty in top ranked programs in business, engineering, law, health and human services, liberal arts and the sciences across more than 200 programs of study. UNH's research portfolio includes partnerships with NASA, NOAA, NSF and NIH, receiving more than $100 million in competitive external funding every year to further explore and define the frontiers of land, sea and space. Caption: Mechanical experiment of 3D printed specimen of design I (with suture tessellation (θm=90°)) under vertical tension, that creates stress and strain in the material in direction 1. Caption: Mechanical experiment of 3D printed specimen of design I (with suture tessellation (θm=90°)) under vertical tension, that creates stress and strain in the material in direction 2. Caption: Mechanical experiment of 3D printed specimen of design I (with suture tessellation (θm=10°)) under vertical tension, that creates stress and strain in the material in direction 1. Caption: Mechanical experiment of 3D printed specimen of design I (with suture tessellation (θm=10°)) under vertical tension, that creates stress and strain in the material in direction 2.